Well, this week I’m heading back to basics with my plunder. 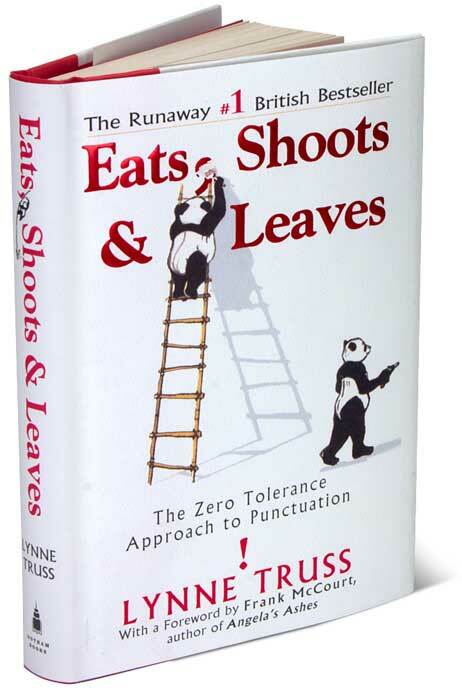 I just finished reading Eats, Shoots & Leaves by Lynne Truss for the second (or possibly third or fourth time). I can still remember the first time I read it and how it changed the way I looked at punctuation forever. In fact, it was this book that took away my fear of the written word in the first place. As I reflect back on my elementary education, I don’t recall ever having a lesson on grammar and proper punctuation usage, so by the time I reached university and was required to write regularly, I had no idea how to use the language to the best of my ability. I could barely spell (okay, not totally, but I do recall that I often didn’t use specific words because I didn’t know how to spell them – the internet wasn’t what it is today and we still used dictionaries and I was too lazy to look up the words). 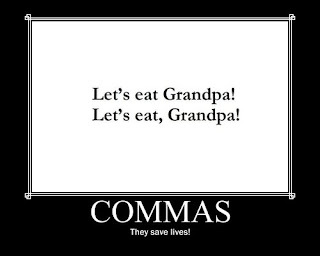 So, my essay would be rife with errors and run on sentences that could have benefited from a thorough punctuation attack. It wasn’t until I read Truss’ book that I even understood how to use a coma properly (sad, I know!). This reading has introduced the colon and semi-colon into my writing. You can look back through my work and actually pinpoint when they were written based on my punctuation use. Even since December, you can see an evolution and it is evident that I was re-reading Eats, Shoots & Leaves. I was really experimenting with the semi-colon; still am. I remember looking back on something I wrote and I had to laugh because every other sentence had a semi-colon in it: I was just so excited that it had entered my life; I wanted to spend as much time with it as possible. My favourite books include: Catch-22, Eats, Shoots & Leaves, 1984, and The Sun Also Rises. My favourite books include: Catch-22; Eats, Shoots & Leaves; 1984; and The Sun Also Rises. Clarity! This isn’t the only joy of the semi-colon, but I am a new user and still exploring all its possibilities. Past Sarah – Well, kind of – it started out all stressful and on the second day, we got in this big fight in Central Park but then something shifted and everything was wonderful after that. Past Sarah - I’m not sure. It was like suddenly Kevin finally understood me and what makes me happy. He even suggested we get our picture taken in bunny costumes in the kids’ zoo. Adrienne – Really? That does not sound like Kevin! Past Kevin – Women: no clue! I feel like not everyone will understand how exciting that little colon is in the short little line, but there is no other mark that I could think of replacing it with that would give me the same intended effect. Punctuation tells the reader the pace and tone at which the text should be read. For authors, this is extremely important, but when you are a playwright and you are writing text that is intended to be read out loud, it is essential to be able to provide as much guidance as possible to the actor. Punctuation is the gift that the writer gives to the actor. I know that there are many people who don’t see the value of maintaining traditional systems of punctuation, but I feel it is becoming increasingly important. After years of being enthralled with the telephone, our Western culture is moving back towards a primarily text based system; our primary means of communicating is through text messaging, email and Facebook posts. Pace and tone is an essential part of ensuring your message is received with your proper intent. It is so easy for text to be misinterpreted by the reader (especially sarcasm!). I was talking to a friend about how excited I was to start really learning proper grammar and he stated that the endeavour was pointless. As a writer, I completely disagree: it is essential. But even as a speaker of the English language, I think it still holds value. Anyhoo, Practical Grammar will be a plunder in weeks to comes, so I will leave some of that rant for then. If you are looking to understand what the deal is with punctuation (writer or no) but don’t want some boring blackboard lesson; please, please, please read Eats, Shoots & Leaves. It is so funny! I actually found myself laughing out loud so many times; even on the fourth time through (and I know that won’t be the last time I pull it out for a refresher). It is a quick and easy read and you come out with such a new perspective on why sometimes a dash is more effective than an ellipsis and how comas can kill. Truss’ follow up book Talk to the Hand is also extremely entertaining, but is far less useful for practical application. You can find Truss’ books, as well as Practical Grammar, at your local bookstores.